There are a number of signs or conditions which may signify that your horse would benefit from a chiropractic exam and adjustments. Not all signs are obvious and often, subtle changes in spinal mobility lead to significant changes in how your horse performs. Horses showing a decrease in performance, such as short striding, cross-cantering, loss of collection, or refusing to pick-up the lead may have some degree of bio-mechanical dysfunction or restriction of the spine. Localized muscle soreness may be indications of improper saddle fit, or compensation associated with joint dysfunction. 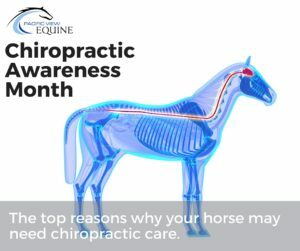 Horses that are recovering from injuries such as tendon/ligament, muscle injuries, trailering accidents, or have more chronic disease such as degenerative joint disease (arthritis) or conformation problems, generally have compensation issues resulting in restrictions of the spine. Performance horses are athletes! Just like human athletes, horses push their body beyond normal motion. This places more strain on muscles, tendons, and ligaments often leading to chiropractic restrictions. In humans, studies have shown that athletes with no injuries performed 10-15% better following chiropractic treatments. As horses age, we can often see different issues arise. A young horse will generally show chiropractic restrictions associated with growth or introduction to work, while older horses often show restrictions associated with arthritic compensation.